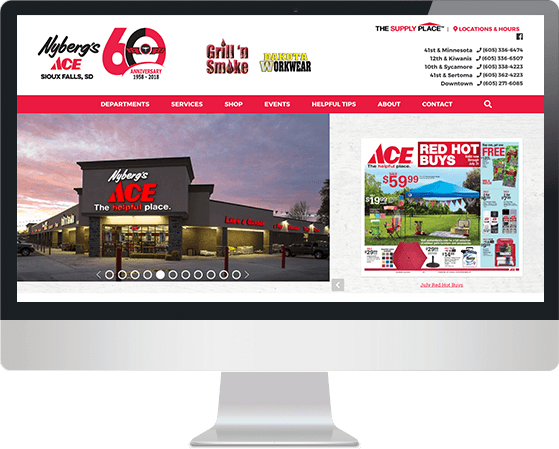 Nyberg’s Ace Hardware is not only recognized as a pillar in their community of Sioux Falls, North Dakota but as a pillar in the Ace Hardware community, too. Since 1958, locally and family-owned and operated, Nyberg’s Ace has been the helpful neighborhood place for convenience, selection, and service in every neighborhood of Sioux Falls. They recently expanded to their 5th location and celebrated their 60th year of service. With that great news came an awesome website upgrade, email marketing improvements, search marketing, and social media campaigns. With 60th-anniversary branding to celebrate, we were able to craft a custom website that is at once on-brand, engaging, and highly impactful. Easy to navigate, the website generates online sign-ups for events and includes custom widgets to find the nearest location. 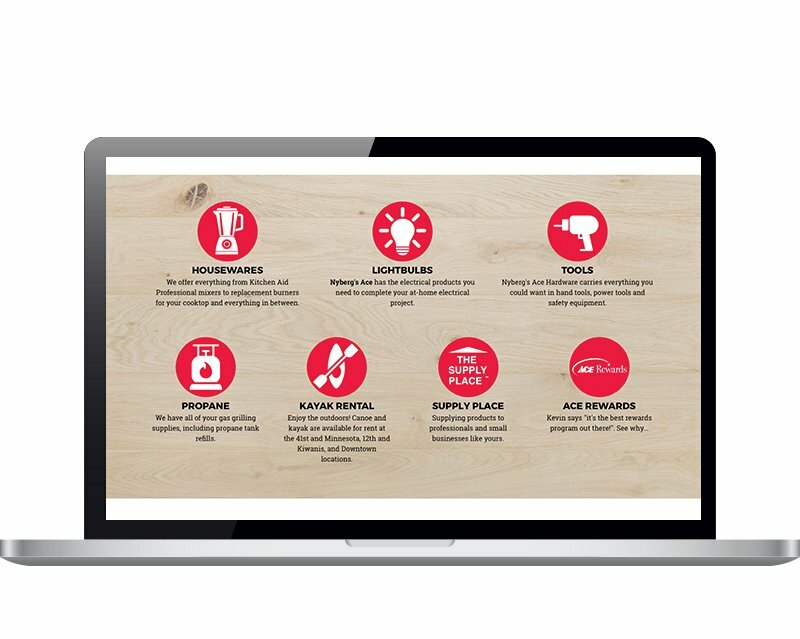 Nyberg's showcases local and unique products and FootSteps' platform makes it easy to highlight their deep-rooted community values. In addition to a new website, FootSteps had the great privilege of helping Nyberg’s redesign their email marketing platform with mobile responsive functionality, a crisp new logo, embedded how-to videos, and a few fun campaigns to ensure their robust list is a healthy one. 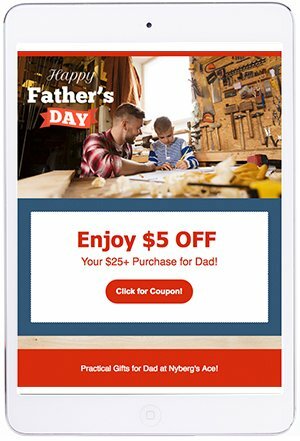 Nyberg’s is a unique operation that truly understands the value of a good email marketing campaign and they consistently provide our Marketing Services team with lots of fun events, DIY videos, and more to work with. Having multiple locations means consumers are served more conveniently when they can find the location nearest them. 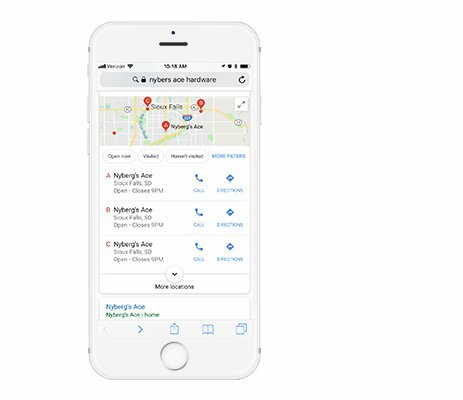 We put our Search Marketing team to task and helped differentiate each location with online maps (like Google Maps, Apple Maps, and Bing location services) in addition to distributing all the location data to search directories to help ensure each location is easy to find and convenient to the mobile-searcher. Backing all the locations with one great website, FootSteps Marketing was positioned to make impactful search engine optimization updates that drive footsteps through the doors. "FSM seems to understand our business and therefore the transition from our previous web host to FSM was virtually seamless."